How and when a Jew covers his or her head is a spiritual declaration and a nuanced social statement. Rabbi Steinsaltz’s guide to Jewish head coverings is directed at the newly observant Jew in an Orthodox setting who must decide what head covering he or she is going to wear, and under what circumstances. For men, the primary question is whether or not to cover the head. This practice has evolved from a minhag (custom) of the very pious to an accepted norm, incumbent on all observant males. Talmudic law does not require covering the head, through there are hints there that doing so is to be regarded as a sign of reverence. But the practice became more and more widespread, until by the Middle Ages Jewish legal authorities everywhere were unanimous that sacred words (prayers, words of Torah) could not be spoken, nor sacred precincts (synagogues, houses of study, even cemeteries) entered bareheaded. Today, too, there is complete halachic [Jewish legal] agreement on this question. Covering the head at all times is a different matter. In Europe, it was the universal custom among Orthodox Jews, except for some in Germany, to do so indoors and out. The most orthodox even did it while sleeping. In the Near East there was greater latitude in the matter, and many religious Jews only covered their heads for sacred activities. 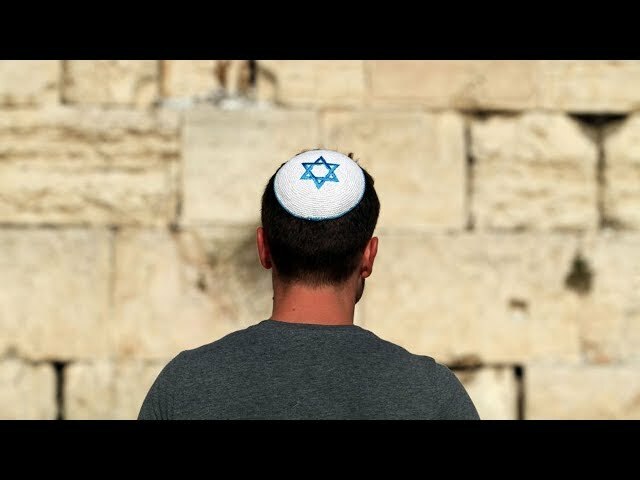 Keeping the head covered at all times has a kabbalistic [mystical] significance, leading some to cover their heads twice–a hat over a kippah (skullcap), or a tallit (prayer shawl)over a kippah–while praying. For various historical reasons–chiefly because most Jews no longer wear a distinctly Jewish garb–the head covering has, for many, taken on the significance of a badge. Once such a view takes hold, it acquires a certain significance in the eyes of halakhah. Even practices with no inherent meaning sometimes acquire real importance from the way they are viewed in the popular mind, due to the notion of kiddush hashem (glorifying God) and hillul hashem (sacrilege). When a given act comes to be perceived by most people as one of hillul hashem, ipso facto, it is so, even though intrinsically there may be nothing wrong with it. It is for this reason that covering the head has become significant and valuable, not because it has any inherent meaning but rather as a conventional sign of belonging to a certain group of people and of commitment to a certain way of life. The [newly observant Jew] must be aware of this symbolism. On the one hand, if he does not cover his head, he will be regarded by the Orthodox (particularly in Israel) as a deviant from the true path, no matter how observant he is. On the other hand, if he is not fully observant, at least in public, the fact that he covers his head may lead others to see him as hypocritical. Indeed, it may cast a shadow of hypocrisy over the entire observant community. Thus, [for a man] covering the head is an act fraught with significance that must be weighed very seriously. Because the male head covering is not explicitly a matter of mitzvah [commandment], either in the Torah or in the Talmud, there are no requirements as to how it should be made. Presumably it should cover most of the head, but as to the shape or materials to be used there are no limitations. Here too, halachically meaningless details can take on a certain significance in the public mind, so that various kinds of kippot may signify very specific things to both religious and non-religious people. Thus, to avoid confusing or misleading people, it is best to find out what the various current significations are. In the case of women, too, there is, in addition to a general requirement of modesty of dress, a specific one concerning covering the head. Married women are required to cover their hair. This is an ancient law, already hinted at in the Torah, that has been observed among Jews all through the ages. In some communities, even unmarried women have been known to keep their hair covered, though this custom never became widespread. The law is not related to that requiring men to cover their heads, and it is even more stringent. The fact that a married woman covers her hair whenever she leaves the house is a sign of her special status. The form in which this practice is observed varies from one community to another. In the communities that were under kabbalistic influence — in parts of Eastern Europe and the Arab world, and among Sephardic Jews — the practice was observed more strictly, such that the hair would be covered completely, with none at all showing, not only in the street but in the home as well. In some countries, pious women go so far as to braid their hair in addition to covering it. But in most areas of Eastern Europe and the Middle East it was considered sufficient to cover the greater part of the hair, and this in fact is all that halacha requires. In any case, there is no doubt that some covering of the hair, however symbolic, is called for. In recent times it has become customary for women to cover their hair with wigs, and this can indeed be seen as fulfilling the requirements of the halacha. Married women are not, after all, expected to make themselves “ugly.” Nevertheless, there have been scholars who have ruled that wigs too must be covered, particularly when they look so natural that they cannot be recognized as head coverings and the women who wear them are not recognizable as married. But this too is a matter of custom and not of definitive halacha. Reprinted with permission from Teshuvah: A Guide for the Newly Observant Jew (Jason Aronson).